Not only can you reuse the same screencast multiple times in the same course, but you can also reuse it in other projects. Just export it. Tip: MP4 videos will be exported with a compression format of H.264/MPEG-4 AVC, an encoding profile of High @L3.0, and a frame rate of 25 fps. 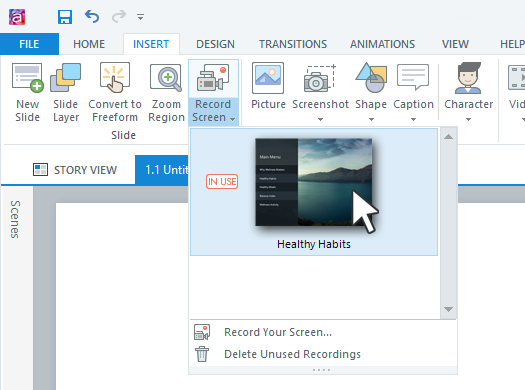 To open the screencast preview window, go to the Insert tab on the ribbon, click the Record Screen drop-down arrow, and select the screencast you want to export. Export Video: This exports a copy of the entire screencast as an MP4 video. Save Frame: This exports an individual frame from the screencast as a PNG image. Use the video controls to locate the frame you want, then save it. The Action Fine Tuning editor lets you change the starting and ending frames for each slide in a step-by-step screencast, but you can also use it to export screencasts. In fact, there are some benefits to using the fine tuning editor over the method described above. Namely, you can export a video of the entire screencast or just a portion of it. Also, when you save a frame as an image, you have two sizing options. Save Frame at Project Size: This exports an individual frame as a PNG image at the size it appears in your course. Use the video controls to locate the frame you want, then save it. Save Frame at Original Size: This exports an individual frame as a PNG image at the size it was originally recorded. Use the video controls to locate the frame you want, then save it.